Guest Artists: Robert Adney and Alex Burgess, percussion; Marc Levine, violin; Julie Johnson, flute; Joshua Weinberg, harp; Scott Lykins, cello; Alira Voices; Sumunar Indonesian Gamelan, Josh Misner, violin; Mary Alice Hutton, violin; Ellie Fregni, viola; Rachelle La Nae, cello; Nick Gaudette, bass; Matt McCright, keyboard. Bob Adney, music educator, percussionist and timpanist, has been a part of the Twin Cities music community for more than 39 years and is a teaching artist at MacPhail Center for Music. He teaches students of all ages and is frequently the teacher of the students who are selected for All-State Band/Orchestra, GTCYS, MYS and MacPhail Concerto winners!. He has also had teaching positions at Hamline, Augsburg, St. Thomas, St. Olaf, Carleton, St. Cloud State University and the College of St. Benedict. He has played with virtually every musical organization in the area, and has a discography of over 22 cds performing with the St. Paul Chamber Orchestra and the Minnesota Orchestra. He has been playing with the South Dakota Symphony for 9 years and was appointed to the Principal Timpani Chair, Fall 2013. During the summers he is the timpanist for the Minneapolis Pops Orchestra and Skylark Opera. In addition he is a founding member of the Minnesota Percussion Trio (1987). Bob is the author of several self-published instructional books for percussion as well as a handful of arrangements and original compositions for percussion ensemble. GTCYS premiered his work entitled Duolog for String Orchestra and Timpani (or drums), March 2016. On the administrative side, he coordinates MacPhails School Clinic Program, Musical Passport Program, All-State Video Online Tutorials as well as the MacPhail Online School Partnership program. He is co-owner of marimbarental.com and author of vintagemarimbamusic.com. Alex Burgess (percussionist/composer) studied at UW-River Falls with Dr. Milne, Craig Hara, Dr. Patti Cudd and J. Michael Roy. He is a highly-caffienated musician in the Twin Cities scene, working with Steve Kenny’s Group 47, Paul Woell, Tommy Bentz Band, Common Space Quartet, among other projects. Apart from that, he is a music educator and percussion teacher at Brickhouse Music, based in River Falls where he lives. Based in Minneapolis, flutist and composer Julie Johnson brings her distinct sound and approach—rougher and more soulful than a typical classical sound, yet more pure than a typical jazz player's—to many multi-genre projects, including places where, she’s been told, the flute doesn’t belong. As a creator and a performer of new music, Julie’s work walks the line between composition and songwriting, art music and popular music, between genres as seemingly different as classical and blues. A finalist for the McKnight Fellowship for Performing Musicians and a winner of grants from the Minnesota State Arts Board, the American Composers Forum, the Lanesboro Arts Center, Springboard for the Arts, MacPhail Center for Music, MRAC, and a Banff Centre residency, she plays in many styles, working to bring both the flute and her audiences to music they haven’t been in contact with before. Scott Lykins’ career uniquely blends artistic performance as a cellist and pianist with administrative creativity as founding artistic & executive director of the Lakes Area Music Festival in Brainerd, MN. Primarily a cellist, he enjoys a busy schedule performing throughout the Midwest. He has served as principal cellist for the National Orchestra Institute, National Repertory Orchestras, Classical Symphony of Chicago, and Eastman Philharmonic Orchestra, and has played regularly with the Syracuse, South Dakota, and New World Symphonies. As a soloist, recent concerto appearances include the Minnesota Philharmonic Orchestra, Heartland Symphony, Northeast Orchestra, and the Lakes Area Music Festival. He has received both bachelors and masters degrees in cello performance from the Eastman School of Music, studying with Steven Doane and Alan Harris, respectively. Also a collaborative pianist, he has performed in recitals and concerts throughout the United States, and recently made his European debut performing Schubert’s Winterreise with baritone John Taylor Ward at the Cite Internationale Universitaire de Paris. Lykins is a graduate of the Catherine Filene Shouse Arts Leadership Program at Eastman and was a member of the 2014 cohort of the Institute for Executive Director Leadership presented by St. Thomas University’s College of Business. Sumunar Indonesian Gamelan Ensemble, directed by Joko Sutrisno, is dedicated to performing traditional and contemporary music and dance from Indonesia. The primary focus is on the traditions of central Java, but as the performing component of the Sumunar program, the ensemble carries out the organization’s mission: to promote an understanding of and appreciation for many forms of Indonesian music, dance, and culture through performance and education. Aliro Voices is a chamber choir dedicated to innovative, engaging, and accessible performances. With passion for music as their igniting force, Aliro Voices seeks to challenge the boundaries of musical experience through innovative programs that engage and inspire audiences and performers alike. The choir focuses on new or under-performed music from all eras, and often finds new or unusual performance spaces. Aliro Voices was founded as the State Fair Singers by Sam Kjellberg in the summer of 2012. When it was clear that the group would continue to sing even after the completion of the Minnesota State Fair, the choir was renamed to Academy of Voices. The group became a home for young adults who had recently graduated from college but wished to continue singing, a demographic which is often under-served. 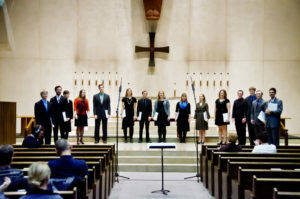 Sam Kjellberg made it his mission to find exciting new or unknown works for choir and bring them to new audiences, often in new places such as the Minneapolis library and the University of Minnesota School of Architecture. The ensemble has performed for the Schubert Club, and has been featured on Minnesota Public Radio under the Regional Spotlight. In the Autumn of 2013, the ensemble came under the direction of Michael Jeffrey. In 2015, the choir set forth a mission statement and core values to guide the group’s work moving forward, and in 2016, the choir renamed to Aliro Voices.